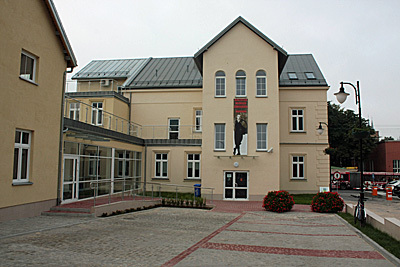 The Ludwik Zamenhof Centre is a city cultural institution established in Bialystok at 19 Warszawska St. upon the motion of the President of the City. It was founded to celebrate the organization of the 94th World Congress of Esperanto that was held from 25 July to 1 August 2009 in Bialystok. The Centre was officially opened for the visitors on 21 July 2009. At the beginning The Zamenhof Centre was a branch of The Centre of Culture in Bialystok, but it has been an autonomous cultural unit since January 2011. The Zamenhof Centre offers the visitors a permanent exhibition - Bialystok of Young Zamenhof – and various temporary exhibitions, concerts, film projections, and theatre performances. Moreover, the Centre regularly holds panel discussions, lectures, and literary promotions. The Zamenhof Centre organises also numerous educational workshops for children and teenagers and introduces modern social and educational projects, such as Living Library and „Discover Bialystok” – an outdoor game realised in the urban area of the city.